Turn interviews into shareable and embeddable interactive chats. 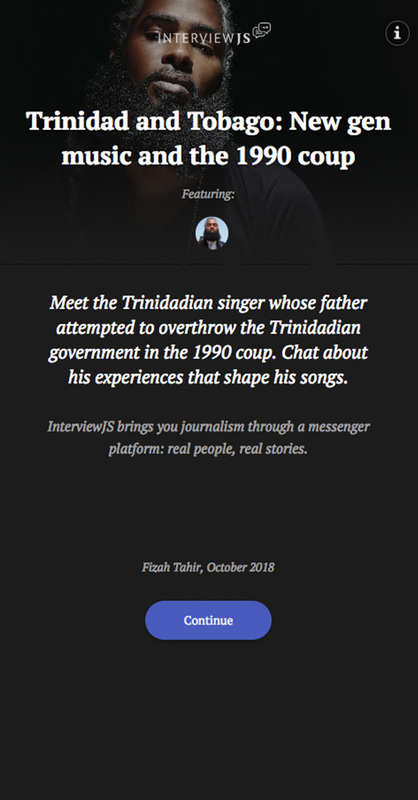 InterviewJS is an open-source tool that takes journalists through the process of building a chat story: creating interviewee profiles and composing interactive messaging exchanges combining text, videos, maps, audio, charts or any other type of embeddable content. The result: mobile-friendly stories in the form of a web app where users engage with interviewees seemingly directly. These chat stories can be shared on social media or embedded on your website. This is the beta version of InterviewJS. It was funded by the Digital News Innovation Fund and developed by Al Jazeera. Try these interviewJS stories - the best experience is on your mobile phone! Stories can cover any topic or debate but should be based on longform interviews. You can edit your interview texts but you can never make up quotes! 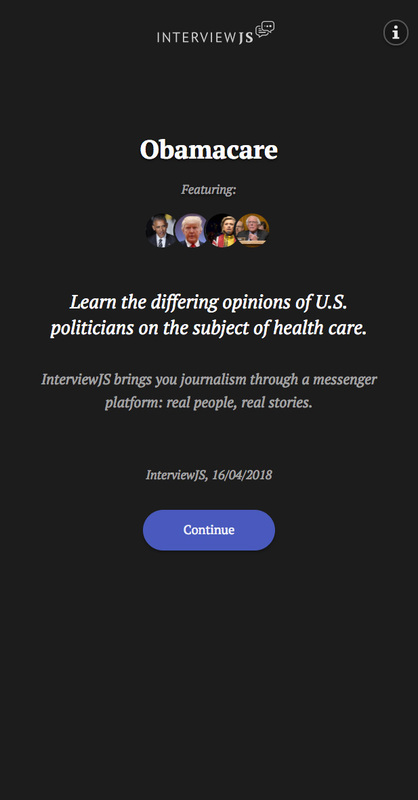 InterviewJS is a journalism tool and rules of journalism apply. Chose a strong issue that allows interviewees to hold different points of view. Five different interviewees are ideal but any number is possible. Create a conversation by selecting a strong quote for the chat messenger before writing a question that lead to the quote. Avoid long chunks of text - allow users to engage with the interview through questions and interactions. Go beyond text and maximise your use of multimedia messages: embed videos, maps, sound, and images. Most importantly learn how to create a choice between two questions - this really gives the user agency. Experiment! You can delete messages, rearrange them, and edit text before publishing. Not enough context for your interviews? Consider casting yourself as an interviewee who provides extra info. At the end, create strong feedback questions by getting users to choose between different points of views exposed in the story. Or test their knowledge. Publishing a story generates an original link. Use it to share your story on social media or embed it on your webpage! Nothing is written in stone! You can continue to edit and change stories even after they have been published. 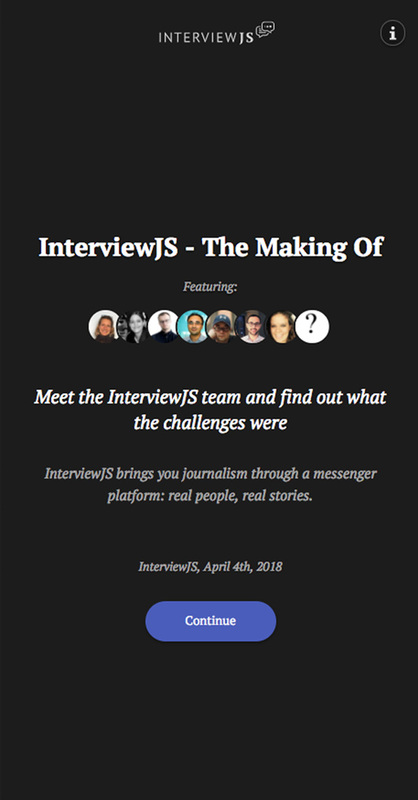 InterviewJS is a free tool made for journalists to turn interviews into shareable and embeddable interactive chats. 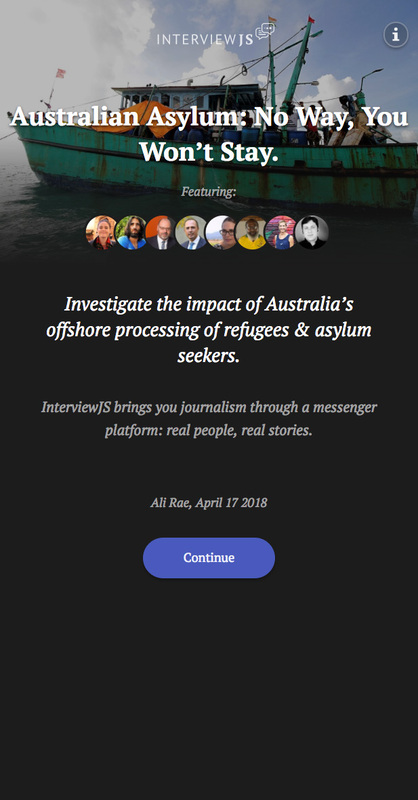 InterviewJS was built by journalists for journalists and newsrooms. Creating your first interview is easy, if you need help watch this two minute guide. Yes, it's free to use and the code is open source for anyone to contribute. How long does it take to create an InterviewJS story? That’s really up to you. You can do a single Q & A or a long feature version with multiple characters, lots of choices, and multimedia. Make sure you give your audience interactive choices, that’s what makes a story interesting. What if I want to build a fictional story? Please do but we would recommend that you indicate this in the introductory text. InterviewJS is described as a journalism tool and it’s important not to mislead anyone. Which phones does InterviewJS work on? Any smartphone with a web browser. This includes most Android, Apple and Windows phones. No, it’s a web app, the entire application is online. Will my interviews be picked up by search engines? Yes, the web application includes all the necessary information for search engines to index. What web browsers does InterviewJS support? Can I embed an interview into my website? Yes, after you finish building your story, grab the embed code and paste into your content management system (CMS). Can I add custom styling to my interviews? Yes, by downloading the zip file and modifying the style sheets. You own your story and are responsible for all of its contents. Does InterviewJS access my Facebook messenger, Whatsapp or any other programme on my phone? What do you do with the the information from the poll at the end? Nothing, we’re not in the business of harvesting data. This is a platform for factual storytellers. How can I contribute to InterviewJS?